Bryan Connor is a 21-year-old freelance designer & developer living and working in Baltimore. Covers for C.S. 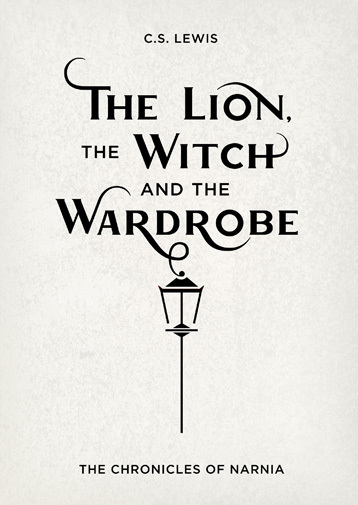 Lewis’ “The Lion, the Witch and Wardrobe” have always been illustration heavy and with good reason considering the book was itself illustrated and meant for children. Now more than a half century old, the story has passed into legendary status and the title is more recognizable than any image corresponding to it. I decided to take a more typographic approach to the cover and as a result I hand lettered all the type for the title to give it a wild and mystical feel. The remainder of the cover is simple and classic with the only graphical element being the gas lamp featured in the story.